Discuto automatically separates your document into numbered paragraphs , wherever it finds a new paragraph (pressing Enter) in your content. Because of this, we recommend formatting your document usuing a wordprocessing program, such as Microsoft Word prior to uploading to Discuto. This gives you complete control over where in your document you want the discussions to be, and enables you and your participants to clearly and quickly understand where to comment. 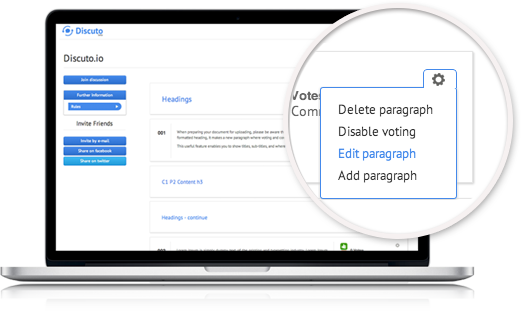 When preparing your document for uploading, please be aware that wherever Discuto finds a formatted heading, it makes a new paragraph where voting and commenting is disabled. This useful feature enables you to show titles, sub-titles, and where new topics begin. How do I set a heading in Microsoft Word? Let’s use the above text as an example. You can see the “headings” has been highlighted and, in the top-right of the screen, been changed to a "Heading 1".For more information about formatting in Word, please visit http://support.microsoft.com/find-solutions/office. 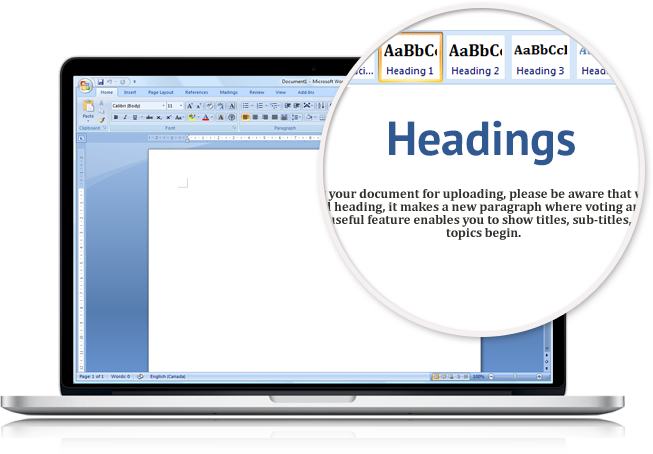 You can format your document using Microsoft Word, Libre Office, Google Drive or other Word editors. 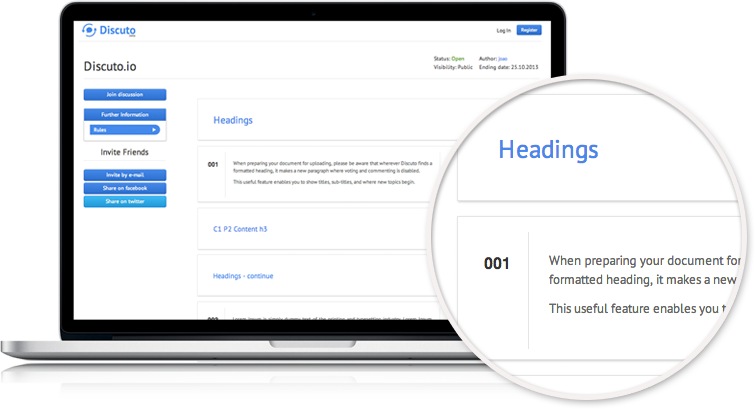 In discuto "Headings" has been identified as a "Heading 1" and was automatically formatted accordingly. Paragraphs are also detected automatically based on new paragraph (Enter) in the word document. Carriage returns are not considered as new paragraph characters so they do not create a new paragraph in Discuto. The second step of the process consists in uploading the document to create your discussion. After the document is formatted you can in one click turn your document into a discussion by hitting upload. You can upload any kind of document format such as doc, docx, odt, html or google document format. 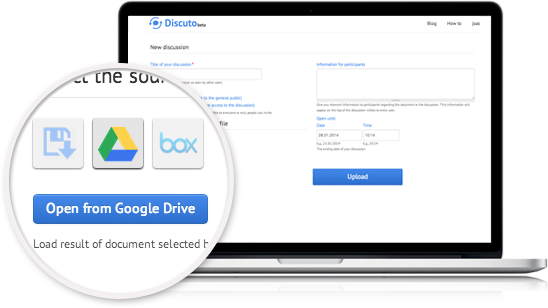 Discuto makes it easy to upload the document giving the option to upload directly from the user's computer or by getting the document directly from Google Drive. Other integrations with tools such as Box or Dropbox are in the way..
One of the crucial steps of setting up your discussion is inviting and making your community engaged in the discussion. 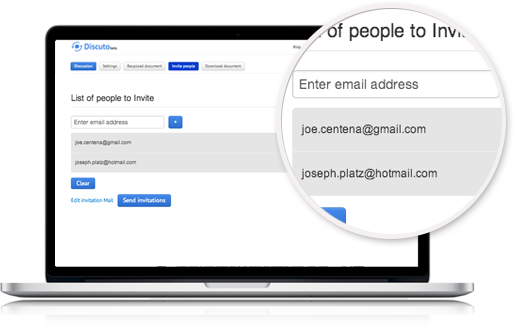 For inviting members simply add the email addresses in the Invite People box and Discuto will take care of the rest. On private discussions only members you invite will be able to access your document, for this you must send invites trough the discuto system so they get white listed and get access to your discussion. 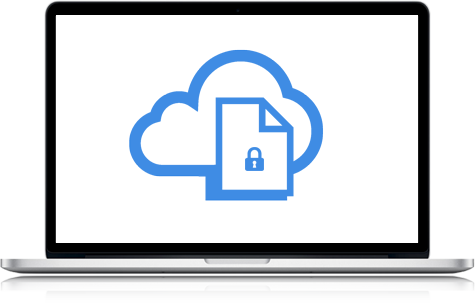 This ensures your document is safe and is not accessed by anyone outside your list of users. Users who already have a Discuto account will receive an invite to your discussion with their existing account. 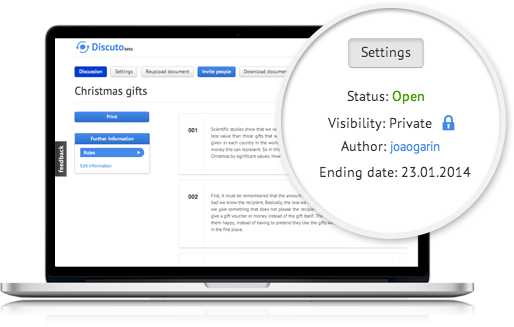 Discuto provides a dynamic discussion based on the document you uploaded, where the document get's updated while the discussion is going on. By means of a consensus meter you can better understand which parts of the document should be changed to increase consensus in your group. 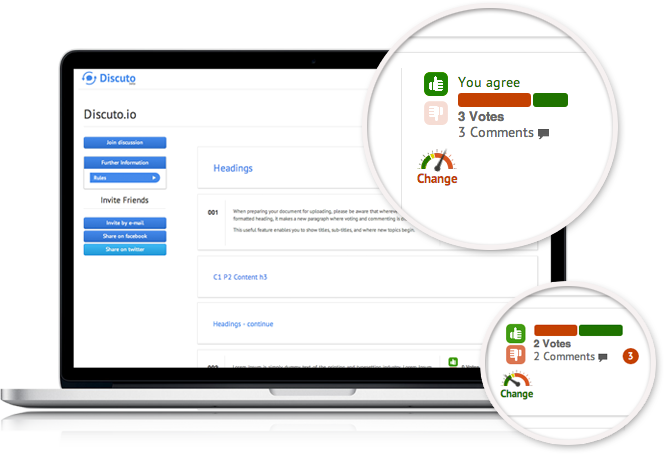 Discuto’s innovative consensus meter gives you real-time reaction to your document. Do you want to achieve agreement among participants, or you want to increase debate? 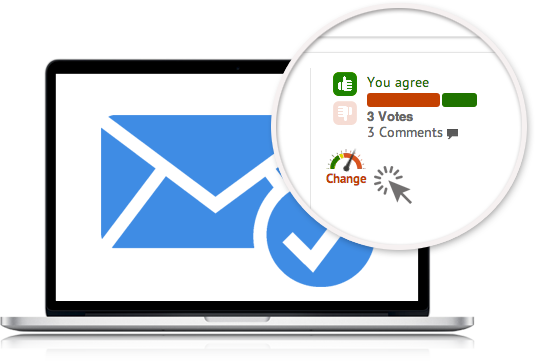 You can use the consensus meter to alter your content based on the votes and comments you receive. Adapting the document "on the fly"
You can make changes to your document directly on the discussion. Click on "Change" below the consensus meter. Whenever you make a change, votes and comments are reset and all participants who have voted and commented are notified. The previous version of the paragraph is saved so you can track your changes. Once the discussion is over and changes are made based on the feedback of every participant you can easily download your document from the platform. As a measure of privacy, at no time (versions of) your document are stored by the system, rather it get's generated when you want to download it. If you want to show how your discussion progressed from start to finish, you can choose to download “with comments and votes”. If you want to have the final document with no extras, you can choose to download “without comments and votes”. Then choose your preferred format and click “Download”.